Get this I Don't Want to Grow Up Costume, and you will have everyone giving you double takes! 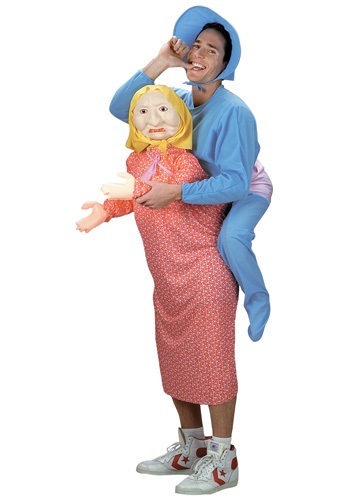 It's designed to look like an older woman giving a piggyback ride to an overgrown infant! The costume is a combined dress/pajama jumpsuit; inflatable components for the woman's head, arms & torso and the infant's legs are inserted into shaped compartments. The dress portion of the suit is red-on-white floral print polyester interlock knit, and the pajama portion is blue polyester brushed knit flannel. To wear the costume, the inflated legs are inserted into the legs of the pajamas, then the wearer steps into the skirt of the dress and slips into the pajama arms. Then the inflated torso, arms & head piece is inserted into the top and arms of the dress. The molded plastic mask is placed over the inflated head and the yellow flannel scarf is tied in place. The pink flannel sling is then tied around the inflated infant buttocks and woman's shoulders. Finally, the wearer puts on the blue flannel bonnet for a hilarious effect!